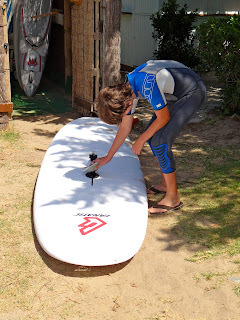 You may be wondering about the success of our windsurfing plans in Spain and the continuing saga of the GoPro camera. Well, the GoPro saga continued its downward spiral, but the windsurfing, I'm happy to say, was a triumph for everyone. The GoPro camera, which was purchased by hubby before the trip to mount on his windsurfing board and get some radical footage of him shredding the water, tragically lost on its maiden voyage, and then replaced utilizing a generous discount offered by GoPro, was then - in Spain - absentmindedly left with the power on the morning before the shredding occurred, thus eliminating all hope of digital footage. The GoPro camera spent the three weeks of our trip basically serving as dead weight in our luggage. My son, daughter, and husband windsurfed two full days in Tarifa, Spain. We rented a spacious apartment on the beach, about a 15 minute drive from Valdevaqueros Beach, the hottest spot for windsurfing in Europe. Club Mistral, the German windsurfing equipment rental chain, has a large shop at Valdevaqueros Beach, and we had reserved our equipment in advance with them. My husband has rented from Club Mistral in other locations before and has always been satisfied with their friendly staff and the quality of their equipment. He was especially pleased with their service this time because they were very flexible, allowing the kids to change out their equipment as needed and also to add an additional day of surfing for them to his existing reservation instead of charging for a new rental. The only mistake he felt he made was booking a pre-reservation at home before we left. The Club Mistral website suggests doing so in case they run out of equipment, and require a 3-day minimum rental. Upon arrival at their shop we noticed there was more than enough equipment to not have reserved in advance, so we wasted money by paying for the required three days when we only windsurfed two. at Club Mistral in Tarifa. The first day out on the water the kids took a lesson with Jana, a cute German girl who spoke perfect English and remained out in the frigid water with them for 2 hours. My son and daughter learned how to rig the equipment and how to carry it to the water. Both my son and my daughter stood up on the first day and managed to sail a short distance. Photo op at Valdevaqueros Beach in Tarifa. They also have big giant bean bags on the sand for relaxing. But since we had a rental car, I just drove back to our nice apartment on the beach and napped until it was time to pick up my very tired windsurfers! The windsurfing looks awesome! There's sure a lot of parasailers there though. I don't think I've ever seen that many parachutes in the air at one time, and they don't look that far apart. Too much stress for me. I probably would have gone back to the room an napped as well. This looks adventurous, as well as the whole of your blog! And the kids expecially will remember those journies as long as they live. Are you still in Europe, or are you going thwere whenever you catch an opportunity? Hi there! We live in the U.S. but try to get to Europe once every year or two. 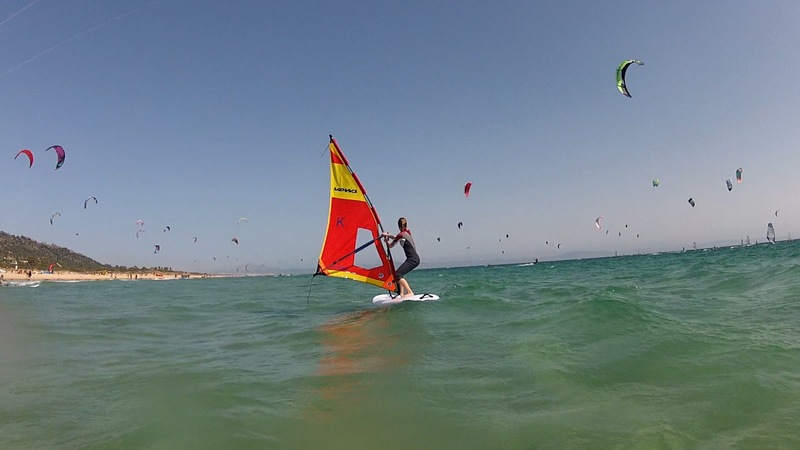 Tarifa is the wind capital of Europe. 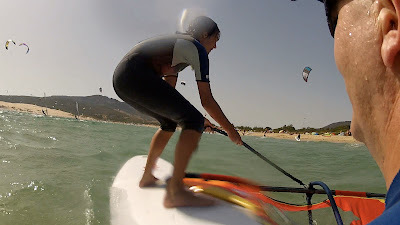 Throughout the year surfing and kite surfing is on the schedule ...Tarifa offers much more than just water-sports though. Mountain biking and quad are mentioned here as well as horseback riding and hiking in untouched and stunning nature of Spain...NIc epost..! !